Innovative design makes for an easy installation. 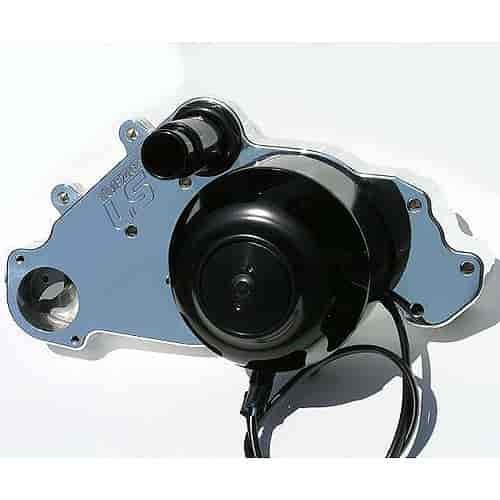 Unbolt your factory pump and bolt on an easy 11-14 horsepower with this street style water pump. An idler is incorporated onto the pump so your belt routing remains in its stock configuration. American made with quality far superior to any other performance aftermarket company, Meziere builds these water pumps with pride right here in the USA. Don't be mislead by inflated flow numbers and competitors' outlandish claims. Meziere 300 series pumps move more water and produce more pressure than any other electric pump on the market. That means better protection for your high horsepower, high demand engine! Overall Height Dimension: The standard pump is 7.80'' long from the mounting surface to the tip of the pump.